It's Friday the 13th and before we get to the gross foods, here's a brief (and freaky) history lesson. With a phobia all its own, known as friggatriskaidekaphobia (say that thirteen times fast! ), Friday the 13th is steeped in urban legend. While hard to believe in the era of TGIF!, Fridays have been associated with all sorts of disasters from stock market crashes to major maritime accidents since the 14th century. In maritime lore, Friday is considered an unlucky day, and an especially bad day to begin a voyage, thus the source of the urban legend of HMS Friday. Well before the movie Friday the 13th in 1980, references to unlucky #13 date back to Babylonian legal documents, the Code of Hammurabi from circa 1,700 BCE. Even developers of many modern day skyscrapers and office towers omit the 13th floor from elevators due to the association with the unlucky number. "It's been estimated that [U.S] $800 or $900 million is lost in business on this day [Friday the 13th] because people will not fly or do business they would normally do," said Donald Dossey, founder of the Stress Management Center and Phobia Institute, who estimates that 17 to 21 million Americans suffer from friggatriskaidekaphobia. The British Medical Journal even reports that "[Hospital] Admissions due to transport accidents were significantly increased on Friday 13th [vs. Friday the 6th] (total 65 v 45) [... and ] the risk of hospital admission as a result of a transport accident may be increased by as much as 52%. Staying at home is recommended." Interestingly, the 13th of the month is 0.3% more likely to fall on a Friday than any other day of the week. Now onto the freaky foods...! 1. 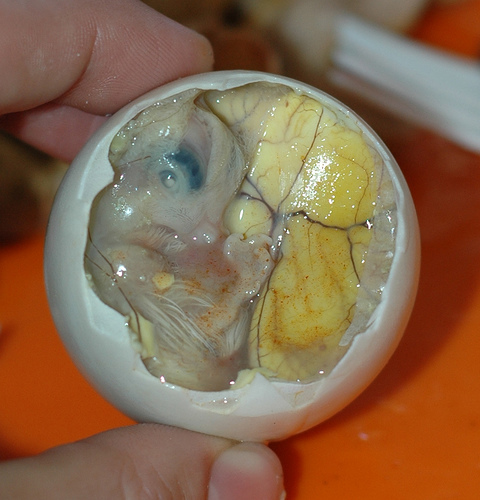 Balut (Seen above and below) A speciality of street vendors across the Philippines and Vietnam, balut is basically a soft-boiled duck fetus. 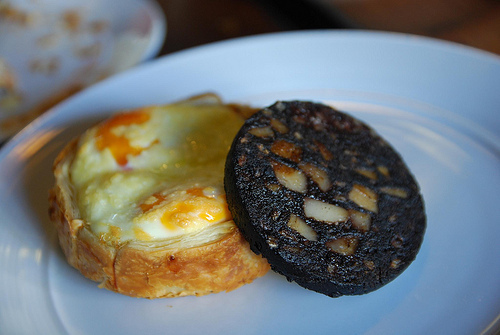 The fertilized duck egg is allowed to incubate in a hatchery for up to 18 days before it is soft-boiled and eaten, straight from the shell with a pinch of salt. 2. Casu Marzu So bad it's illegal. 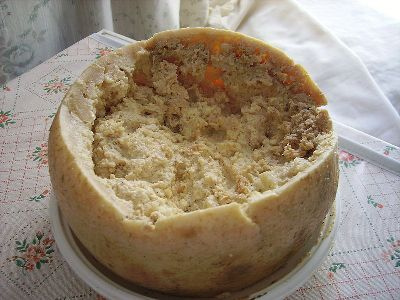 Literally "rotten cheese", Casu Marzu is a Sardinian speciality derived from pecorino, a sheep's milk cheese, that has been left to "ferment" (aka rot) with the aid of insect larvae. The process is considered finished when the liquefied fats begin to seep out of the rind (lagrima, Sardinian for "tears") and the round is riddled with live cheese-fly larvae which, once disturbed, can launch themselves nearly 6 inches into the air. Clearly a violation of every health law ever and dozens of social mores. No thank you. 3. 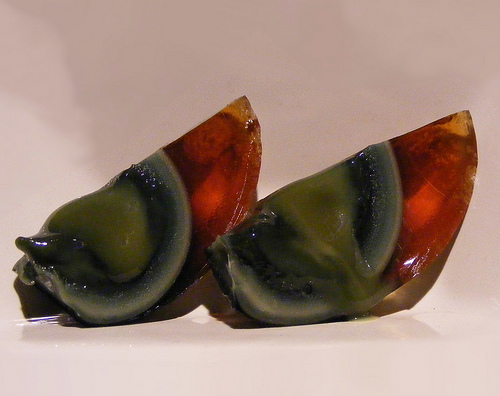 Century Egg Or pidan (after the pine needle pattern which develops) is another Asian-egg delicacy, this time from China. Essentially a chicken, duck or quail egg is preserved and aged for a few weeks... or months... and then sliced and eaten with pickled ginger. Traditionally, the preservation process included packing the whole, raw eggs in clay, ash, salt, lime (okay, mud) and rice hulls, however contemporary methods include soaking the eggs in a brine solution which is said to achieve the same effect: raising the pH level inside the egg and thus, curing it. 4. Stinkheads A traditional Eskimo meal of, well, fermented fish heads - preferably of King salmon. The heads and guts are thrown in a barrel, wrapped in burlap and buried for a week or so. For a while, plastic bags and buckets were used but the nature of the plastic dramatically increased the risk of botulism and contemporary preparation still includes in-ground storage. Eek. 5. 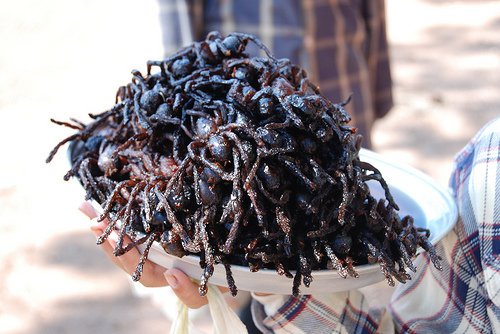 Bat Paste and Fruit Bat Soup While bats are known disease carriers, they are still a relatively common protein source in Thailand, Guam and elsewhere. 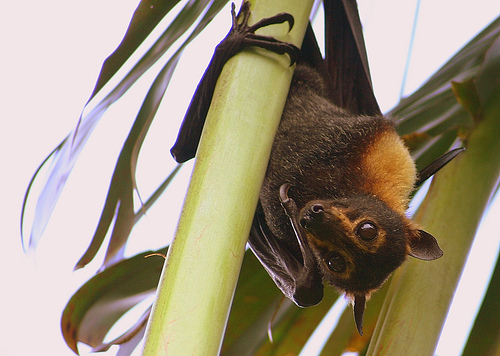 Begin with a freshly-caught adorable little fruit bat in a remote, sub-tropic village. Drop live into a pot of boiling broth, water or milk. Simmer until desired doneness. Discard leathery wing tissue and hollow bones, combine with fresh herbs and blend into a paste - it does "wonders for the libido." 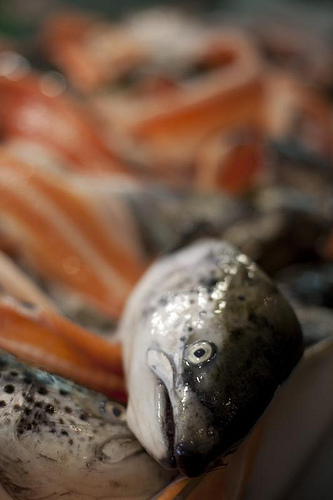 If you're looking for a new aphrodisiac, this may be your shtick! 6. 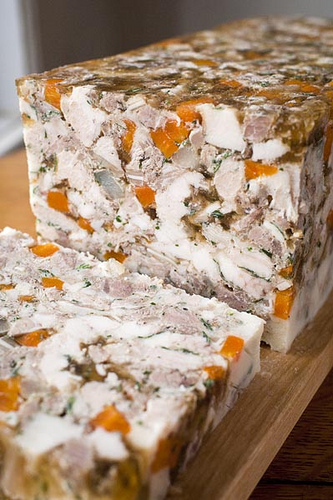 Head Cheese Possibly only made more disgusting when made into head cheese loaf, seen above, which is chock-full of fresh veggies, chunks of meat and ...other stuff. 7. Caterpillar Fungus Basically, a mushroom. That grows from the head of dead and mummified caterpillars. Essentially, the caterpillar fungus is a medicinal mushroom eaten in Tibet and China that is the result of a parasitic relationship between the fungus and the larva of Ghost Moths. Oftentimes, the fungus kills the larva and mummifies the body, growing from the head of the empty shell. Interestingly, the caterpillars (only found between certain elevations in the Himalayan foothills) live underground pupating for 5 years, munching on roots and you know, becoming infected with a dangerous fungus. Used for a variety of purposes, from an aphrodisiac to a cure for cancer, these mushrooms are served up as soup - seen here. 8. Still-Beating Cobra Heart & Blood-Infused Vodka Be still, my beating heart! Now, I'm as much about infused vodkas as the next gal, but this seems a little... oh, I don't know, disturbing. 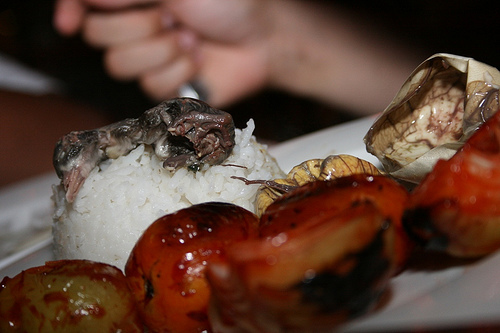 A southeast Asian speciality, swallowing a still-beating cobra heart followed by a shot of blood-infused booze (most often vodka, sometimes whiskey...) is said to make you strong and stronger -- in that order. I know a few brave souls (read: dumb college guys) who've done the deed and said it wasn't so bad. The video? A clip from A Cook's Tour featuring Anthony Bourdain swallowing a cobra heart and gulping down blood-booze - tune in around 5:55 for the whole cobra experience. 10. Monkey Brains Okay, okay, I realize the movie poster is misleading - but this is serious stuff! 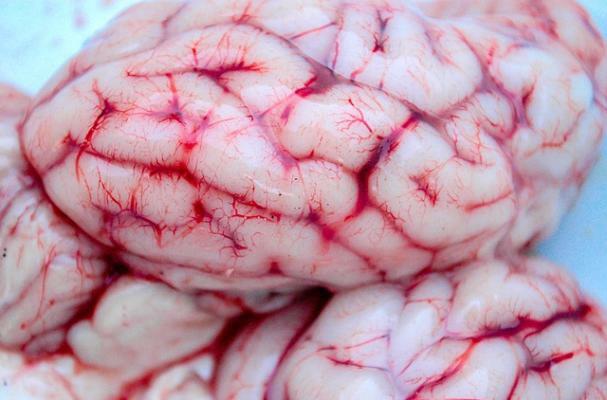 Monkey brains (chilled or otherwise) are a regional delicacy. Rumors surrounding its preparation include serving from the cut-open skull of still-living monkeys and while open-skull presentation is truly traditional, not so of the live entertainment. 12. 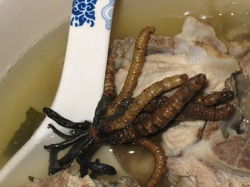 Hasma A traditional Chinese ingredient in both soups and desserts: dried fallopian tubes of Asiatic grass frogs. Sold dried, this reproductive equipment swells immensely when rehydrated in water, broth or coconut milk and takes on a jelly-like texture. Sometimes prepared as soup, hasma is still available in China, Taiwan, Hong Kong and North American cities with large Asian populations. 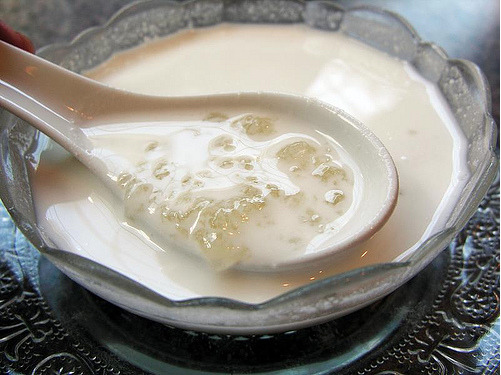 Seen here, the hasma looks pretty delicious - prepared with coconut milk and sugar for a sweet treat with a texture similar to tapioca. Mmm! 13. 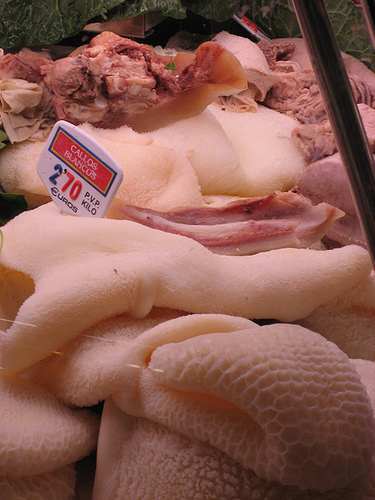 Cow's Stomach Aka tripe is an Italian specialty and still one of Rome's favorite dishes tripa alla Romana. 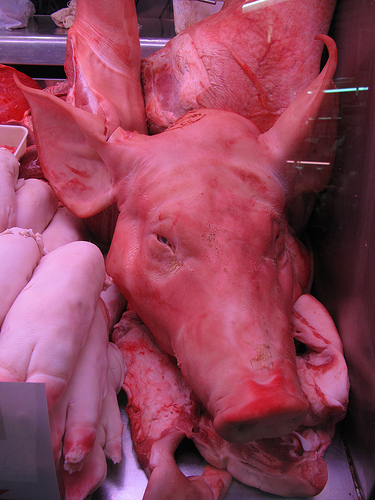 While this is typical fare to some, offal and I have a hate-terrified relationship (I bet you can guess which way it goes), there's just something abut eating stomach that seems... wrong... and maybe counterproductive. Photos by: Paramount Home Entertainment, Marshall Astor, Raelene G, megan powell, Fotoos van Robin, Andy Tyler, Shek Graham, Jordan Sim, Pork Futures, WeirdMeat.com, Paul Mannix, avlxyz, squeakyrat and dipfan.